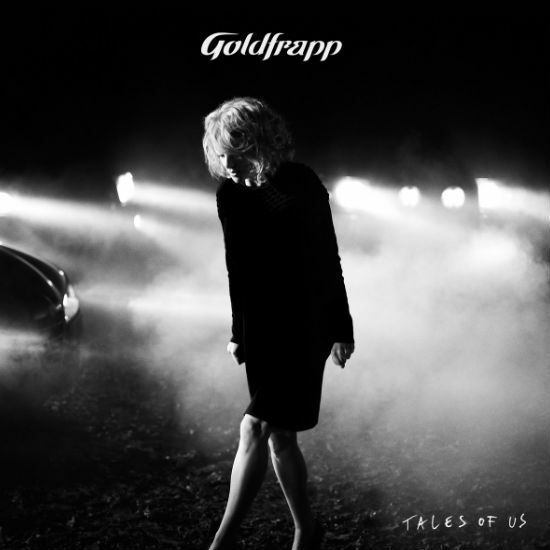 There is a haunting, almost confessional tone to Goldfrapp’s new album Tales of Us, as if you are dipping into an intimate, ongoing conversation between two old friends. Or perhaps that is, many old friends, acquaintances and ex-lovers, or those you might wander past on the street and wish you could talk to, if only for a moment. The sense that you are eavesdropping at a cafe over a steaming hot cup of coffee owes a great deal to the fact that Alison Goldfrapp, one half of the English electronic music duo along with Will Gregory, purrs her way through many of the songs in the same way that many of us would whisper conspiratorial secrets to another. Laid over the sort of mystical ethereal trip-hop tones that first gained the duo prominence on their debut, Felt Mountain, in 2000, a sound they have become known for along with their more glam rock and synthpop tendencies on releases like Supernature (2005) and Head First (2010), Alison sings with a quiet, singular urgency. You quickly want to know who it is she is singing about with such profound conviction. After all, many of these songs, nine of out of which are named after people (the one exception is “Stranger”), have a dramatically bold storytelling quality to them, a sense that you are learning vital, important facts about peoople who might otherwise remain anonymous. “Annabel”, based on the evocative 2011 novel by Kathleen Winter, for instance relates the tale of William/Annabel, an intersex child born in 1968 who is raised as a boy, a gender chosen by his father who disregards his wife’s willingness to recognise “the girl curled up inside him” (she names him Annabel in secret). The song comes complete with a film by her partner Lisa Gunning that evokes all the powerful, if quietly expressed emotions of the song. Its images of soft dragonfly-buzzing and walks along a sun-dappled creek leading to a secret feminine idyll where the young boy can indulge his other neglected self, add to the dramatic intent of Goldfrapp herself. It’s a beautiful marriage of the visual and the aural and testament to the great creativity Goldfrapp have brought to this most epic of musical excursions. “Clay”, which begins with strings and softly-voiced almost Kate Bush-esque melody, is a thing of beauty too, describing the war time romance between two soldiers who find love with each other on a muddy, scarred battlefield. It speaks of the exquisite joy of finding something so precious amidst death and destruction, and the fear that they will never recover it once they are separated. You ache for these two men even as you celebrate the love they have found gazing into the “ancient stars” of each other’s eyes. “Drew” is a similarly evocative recounting of time spent with people who profoundly change your outlook and your perceptions of life, drenched in languid melodies and melancholic bliss. These warm, narratively-rich songs have all been influenced by Alison Goldfrapp’s self-confessed love of European music, films by such imaginative cinematic auteurs as David Lynch and Ingmar Bergman and the novels of Patricia Highsmith, all filtered through the lens of a great and enduring love of storytelling. Married with music that is at turns haunting, starkly beautiful and sorrowfully sweet, Tales of Us is the sort of album that you are absorbed into, much like an endless early morning conversation with good friends, and those who you are yet to get to know well. And I suspect that unlike these intimate pre dawn reveries that you want to last forever but which wither with the rising of the sun, this album and its rich emotional resonance and gorgeous melodies will stay with you long after the last confessional word and note has sounded.